How Two Corks and a Bottle got started! So the story begins during Christmas of 2008. 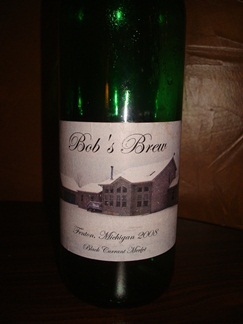 John's brother, Bob sent everyone in the family wine that HE MADE! John said, "You made this?". Bob responded, "Yah! Cool, huh?" It was actually pretty good. Well, in April of 2009, John was up in Michigan and Bob said he was going to make another batch and asked if he wanted to tag along. While there John found the place very relaxing and interesting that you could pick out the type of wine you wanted to make and start it right there. Six weeks later it would be ready and you could bottle, cork and put your own label on wine that YOU made. What a neat concept! It just so happened that there were franchise brochures on the counter. As he always did, John picked one up. He usually investigates them and the dream slips away and life goes on. This time, when John returned to Dallas, he asked Elwyn, his best friend who was about ready to retire, what he was going to be doing. Elwyn wasn't sure. After showing him the brochure Elwyn said... sounds interesting... look into it and see what you find out. To make a long story short... John did some investigations and found four franchise systems in the United States. Next thing you know John and Elwyn were in California checking out the Wine Not International winery system. One thing led to another and now you have Two Corks and a Bottle ready to serve our guests with our special wines! Whether you’re just beginning to learn about wine or are an expert who enjoys wine from around the world; you’ll find our winery will be the perfect place to explore exciting new tastes and even create your own personal vintage. We import only the finest grapes sourced from vineyards worldwide; enabling us to craft outstanding wines with a true international flavor. Red, white, and fruit wines and some specialty wines are all available. We’d love to have you join us for wine tasting and select your favorite bottle of wine—you can even create your own custom label. Or, in our cozy atmosphere, you can spend some time at the bar or with your friends enjoying a glass or two of your favorite wine. If you’d like, you’ll also be able to select your own personal vintage (about 29 bottles) or “adopt” one of ours. Come back 5 to 7 weeks later and have a bottling party! You can also sign up for our Two Corks Wine Club;providing you the opportunity to enjoy a new wine every month for a fraction of the cost of most imports. You’ll also have the first opportunity to try new wines, special sales and events, and discounts on bottles, accessories and batches of wine. So just click the E-Newsletter link on the left and give us your contact information so we can keep you up-to-date on our specials and events.